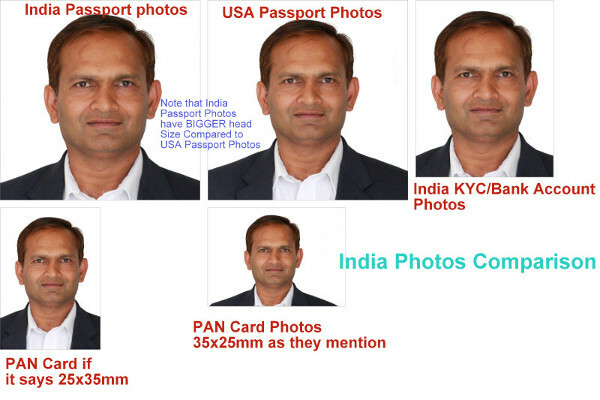 Indian Passport photos are 2x2 inch (51x51m) size for Indian consulates in USA. They are similar to USA Passport photos with one major difference. Indian passport photos require head to be much bigger compared to the size of head required in USA passport photos. USA requires head to be between 1.12 to 1.37 inches while Indian passport photos ask for head to be around 80%. Consulates of India in the USA require an Affidavit for Change of Name by Woman Applicant Consequent Upon Marriage. This form submission requires a 2 x 2 inch photo which needs to be a joint photo of the couple. There are no published guidelines for the photo but you can place an order with us and we will help you get "Joint Photograph of 2" x 2". After you place your order, forward us the email you receive from PayPal and let us know that you need a Joint Photo for Name Change on Indian Passport. If you are in Canada, you can still order with us and get photos within a day at no extra charge. We will make 51 x 51 mm photos for you and email them on a 4x6 inch print format which you can get printed at home or at any local photo store, like any digital camera print, and you will get exact sized 6 photos for Indiain passport renewal. Consulate General of India Toronto and Consulate General of India at Vancouver outsouce passport photo processing with BLSIndia Canada division which requires 51x 51 mm sized photos which are very similar to USA passport photos. OnlinePassportPhoto.com can help you get passport photos in 2 easy steps. Take a photo at home with your digital camera, upload it on our website and make a payment. We will mail your photos with 2 business days or you can provide us Walgreens store address on your payment with PayPal and you will be able to pick up your Indian passport photos there within 1-2 days at no additional charge. Online Passport Photos will provide you Indian Passport Photos at a low price of $7.95 (including shipping and handling). If your consulate requires 35mm x 35mm sized photos, you will get 8 passport photos and if your consulate requires 2x2 inch photos, we will provide you 6 passport photos for renewal of your Indian Passport. If you are applying for a passport in India, you don't have to worry about passport photos. They will take your photo in the passport office only. For children younger than 4 years, you will need to bring 35x45mm sized photos. For general use in India, like for Bank Account or Power of Attorney, or for renewing Indian passport in Canada, you can use 35x45mm or 35x35mm sized photos. 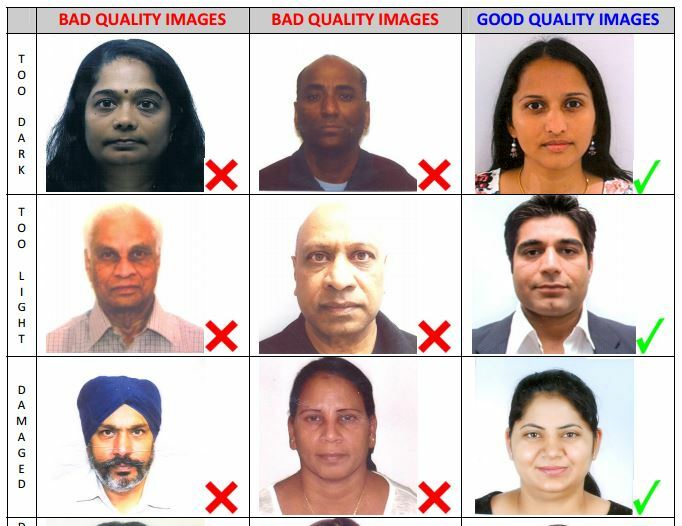 Click below to make your payment ($7.95 for 6 or 8 Indian passport photos). Note: For Houston consulate, you will get 35mm x 35mm sized photos. For other consulates, you will get 6 2x2 inch photos. If you need 35x35mm photos for some other purpose (like opening bank account or for a power of Attorney, etc. ), please select the size of 35x35mm while making your payment with PayPal, or click on this link and let us know the size. The Consulate General of India, Chicago outsourced the handling of Passport and related applications to M/s. BLS International Services Ltd. The outsourcing arrangement in respect of the area falling under the Consular jurisdiction of this Consulate have come into effect on 7th May 2013. With effect from May 07, 2013, M/s BLS International Services Ltd will be the new service provider for Passport and Passport Related Services. Handling of Passport applications has been outsourced to M/s BLS International Services Ltd with effect from 7th May, 2013. BLS International Services Ltd in Houston is located at 9800 Northwest Fwy, Suite 602, Houston, TX- 77092. Embassy of India in DC has outsourced Passport Applications and Renewal to BLS International. Please click here for details about the Passport renewal process. BLS requires 2x2 inch photos. Their specs are messed up as they show some 35x45mm photos and some 35x35mm photos in their samples though they clearly mention 2x2 inch photos in the specs. Here is a link to their specs.